“After a long hiatus from Wanderung, but not hiking, I decided to post a callout for this day hike of Singing Pass & the Musical Bumps. I have to admit it’s quite an ambitious objective for all but those in great fitness. Seven other people signed up for this hike. Unfortunately, two of them dropped out, one due to a legitimate illness, the other due to inclement weather? The trail was in great condition. All the way to Singing Pass it was generally firm snow, but still had a bit of cushion underfoot which was ideal for snowshoes and skis (unlike the hard-packed concrete conditions you sometimes get on Seymour/Hollyburn). Although the BC Parks websites posts warnings for creek crossings, these have long been covered by snow. 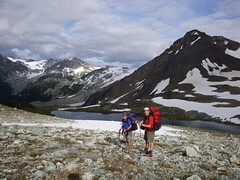 “Three of us started the megahike at 8:30 am from the parking lot near the Blackcomb gondola. 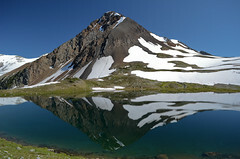 At a relaxed pace we reached Russet Lake right before noon and after a short break moved towards Whirlwind Peak. The weather was as epic as our hike with clear blue skies and warm air. 🙂 On the way up we put on crampons and with the help of ice axes ascended via a pocket glacier to the saddle between the Fissile and Whirlwind Peaks. From there we crossed the top of the pocket glacier and ended up on the Whirlwind Peak at 1:50 pm. After a 30 min snack break we started totally gorgeous ridge walking towards Overlord mountain. 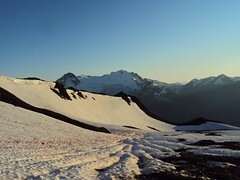 It is mostly scrambling with small patches of snow closer to the Overlord Mountain. At 3:40 pm we reached our destination and enjoyed late lunch under severe exposure to awesomeness. We took about an hour to will ourselves to leave this beautiful mountain but we found strength and started our way back home. We summitted Whirlwind Peak again but this time we used the eastern ridge to descend from it to the plateau using snow fields for boot skiing down as much as possible. Near the first stream of water coming from the glacier we refilled our water supply using a filter that I brought with me to avoid carrying too much water. We timed perfectly as the sunset found us stepping on a wide Russet Lake trail. After Singing Pass we proceeded through the forest with head lamps. At 11:20 pm we finished the megahike at the parking lot. Due to some minor knee malfunction of one of my companions the descent took almost the same time as the ascent but nevertheless it was unbelievably good day. “Do this trip soon! Eight of us headed up the steady gradient of the Singing Pass trail on Saturday, towards the meadows where a variety of alpine flowers were in bloom and more had yet to open. Russet Lake had plenty of excellent camping spots. It got cold: we measured minus 2 degrees at night while we were still awake! On Sunday six of us day-hiked to various altitudes on Fissile Peak in glorious sunshine. It’s a tricky scramble and only one of us got to the top, but even a partial ascent gave excellent views. After waiting out a spell of bad weather at the Russet Lake hut, we hiked out in temporarily less-bad weather along the Musical Bumps trail. I discovered that a scrambling helmet is fun to wear in a hailstorm – you hear the clatter of hail while keeping dry and cozy. The fog cleared and the sun came out occasionally, enough to appreciate the beauty of the region, which included black bears and gregarious marmots. The (free) gondola to the village was scheduled to run until the late evening that day, so it was past 7pm by the time we got to the Dubh Linn Gate pub for dinner. The gondola is scheduled to run until late a few more times this summer (Sept 3, 4, and 5), but call Whistler Guest Services (1-800-766-0449) to confirm.